When my children were between the ages of 4 and 9 we lived in a place that was very flat geographically. However, we had a ditch in our front yard that collected with water when it rained. The boys would watch it fill with anticipation and as soon as the storm would pass they threw off their clothes, pulled on their rubber boots and headed for the ditch. making the dirt an unimportant factor. I remember playing as a child in the water filled potholes in the driveway after a summer rain. If it was a light rain with no thunder and lightning we would stomp around in the puddles under umbrellas. My cousins and I would hop and splash and fill the air with laughter. There were few activities as much fun. It was that simple, spontaneous play that created fond memories of being a child. My husband questioned my judgement in allowing this activity. He had grown up in the city with no water filled pot holes in the driveway and ditches in the front yard. However, after viewing the first session of such delightful, simple fun, he joined the activity! Clothes will wash and dry. Dirt is not a permanent problem. Relax and have FUN! Children are the best inventors of fun and creativity…if we let them. Of course, we must always watch, be mindful of safety and use common sense! 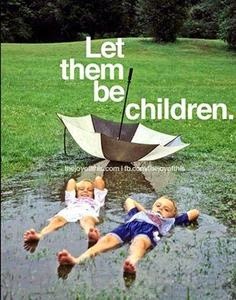 Play allows children to be creative. Creative people think out of the box and become successful, productive, self-sufficient adults. What will you do today to have fun with your kids? Follow their lead and jump into the fun! I LOVE this photo! Thank you to whomever took it. The photo source is unknown, as I found it on a face book post. If you know the photogrpaher, please share and we will give the credit due on this delightful photo!